A Press Officers Take on the UK 1997 General Election - Gary Ling, Digital Producer, Data Monetiser, Political Savant, Information Economist, Solution Seller, Business Strategist. 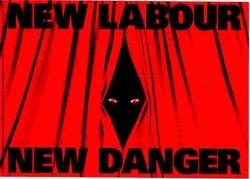 Perhaps the most prominent and lasting memory that many will have of the Conservative Party's 1997 General Election campaign was the advertising agency inspired theme "New Labour, New Danger". I don't know how many millions of pounds it cost for these geniuses to think it up but it seemed to get the campaign off to a poor start from which we never recovered. Indeed, it is indicative of the effectiveness of the campaign as a whole that my most memorable experience as press officer for the Scottish Conservative Party was the visit to Edinburgh of the Tory Chicken. Debate Tu? For the information of those of you who neither remember nor cared, the role of the Tory Chicken during the 1997 General Election campaign was to harass Tony Blair as he campaigned his way across our Great Land. The reason for this was to highlight the fact that the UK Labour Party Opposition Leader had the temerity to refuse to debate Conservative Leader and Prime Minister, The Right Honourable John Major. An Offer They could refuse! Clearly in formulating this offer the Tory strategists in London assumed that the Prime Minister would whip Tony Blair in any such encounter. This policy can be viewed as being either supremely brave or downright stupid depending on your point of view. On the one hand, it goes against the conventional wisdom that the incumbent should not accept, let alone request, any debate challenge from his opponent since it puts them on the same level in the perception of voters. On the other, the PM’s advisors demonstrably believed that Tony Blair was ‘cheeseiness’ personified. A British version of former US President Jimmy Carter who, the PM would swat in any debate, partly because the setting would force Blair to ante up his views on some of the more controversial issues he was ducking. Upon reflection, in this world of spin and political intrigue (what fun!) what’s most interesting is that the Labour Party team must have shared this same analysis. They saw no advantage in stepping up to the Prime Minister’s level so, as a result, had inherited the Tory Chicken as Mr Blair’s constant companion on his visits across the country. To be frank, when the call came from London suggesting that I was to organise to receive and activate the Chicken it was a bit of a relief. The Scottish Conservative Party’s media team’s sixteen-hour days in the campaign so far had been undermined by the bickering in London amongst senior cabinet ministers on Europe and blighted by having to respond to a blizzard of press releases from the Scottish National Party on the delineation of the continental shelf and the share of oil wealth that should accrue to an independent Scotland. Given the number of pages the SNP used to set out their position on this topic it was clear that they were no friends of the environment! So off I set, determined to plan the visit of the Chicken like a military operation. First, I needed to know when and where Mr Blair would be holding his news conference. Our London sources knew only when our Tone would be in Scotland, not the time nor location of his press conference and calls to sources on the so-called friendly press like the Daily Mail got me precisely nowhere. Strike one up for journalistic integrity! But then one of our media team had the brilliant idea of calling our equivalents in the Labour Party press office under the guise of being a German television crew wanting to film the great man in action. With a fake German accent that would have done Basil Fawlty proud ‘Frau Helgar, from German TV' requested the information and much to our surprise the result was a faxed reply giving a detailed itinerary of Tony’s visit. The venue it turned out was the lounge bar at the Edinburgh Sheraton – a place I was very familiar with since it had been my ‘Happy Hour’ watering hole for several years when you could get a decent bottle of bubbles for only a tenner! On the morning of the big day I did a recce of the venue and bought a room as staging post on the fifth floor. Problem was, I had a beautiful view of the square at the front of the hotel but not one of the back, which I assumed would be the entrance that Special Branch, would use for Mr Blair. This situation soon resolved itself when I found a fire escape at the rear of the hotel that gave me a perfect view of the back entrance and also brought me straight out into the lounge bar area of the hotel where, that afternoon, Mr Blair was to launch a beer named after him. The Chicken’s now had his run (er, Ged it?). Arriving at the hotel we split up, entered via different entrances and rendezvoused with other members of the team in the room on the fifth floor. You may think that this was a bit OTT and that we were unduly making this an adventure like something out of Mission Impossible. But I had been around long enough to know that Labour would have an advance party in the hotel by now and would be on the look out for a hit by the Chicken. In any case, you try sneaking around the lobby of a first class hotel carrying a chicken head (wrapped up of course) and a blinking great sign saying “Still running from TV debates Tony?” It’s not exactly inconspicuous is it? I had positioned a member of team on the first floor fire escape with a good view of the back entrance with instructions to call when the Labour Battle Bus pulled up to disgorge our target. The Bus was late and waiting for the call was agonizing but then it came. It was time to make our way down the chicken run. We ran along the corridors on the fifth floor and entered the fire escape. Taking the steps two at a time we raced down to the first floor only to stop dead in our tracks as we turned the corner and realised that we were in full view of the car park and back entrance as Mr Blair, his minders and hangers on were entering the hotel. We tucked the Chicken in a corner near the toilets and telephones (which were actually located in the fire escape!) and a few of us stood around him to give him cover. This proved easier said than done since this area of the hotel became very busy as people came to have a pee before the big event and to make calls to newsrooms and others from the public phone bank. On more than one occasion a journalist almost stood on the Chicken's foot. In fact, for supposedly observant people these news hounds couldn't find a feather in a chicken coop! My respect for Noel was sky high when after 30 minutes we got the nod from one of the team in the lounge that Mr Blair was about to get the ball rolling. Spending thirty minutes in a chicken suit crouched down in a cramped space, fearing getting well plucked was enough for any man (or beast). He sprung up (like a spring chicken!) and joined me near the doors of the fire escape entrance to the lounge bar area. I remember vividly counting to three and in we marched. What an entrance. It was BRILLIANT! Following me, Noel strutted right towards the melee surrounding our Tone as we tried to find a good vantage point to make our photo opportunity. At this event Mr Blair was launching a new ale which had been brewed in his name (a sour brew it was too!). As he was facing the hoards of photographers pulling his first pint at the bar we got in behind him but the Labour minders dressed to a man in Hugo Boss suits (these really were champagne socialists) and Blair Babes (who all looked exactly the same - honest) saw what we were up to and moved to make a 'blocking screen' in front of us. At this point I grabbed Noel around the bottom and lifted him as high as I could. Immediately I knew we'd scored. A great roar of laughter arose from the ranks of the assembled press. On the TV news that night I had my sound bite and some great footage. Completely oblivious to what was going on behind him, Tony Blair is seen pulling his pint and over his right shoulder, high above a crowd of Hugo Boss suits, climbs a triumphant Tory Tartan Chicken (clearly showing his important banner with our message). Even the Scottish Sun covered it the next day (see clipping). The Tory Tartan Chicken was a light and fun side show in an otherwise gruelling and painful campaign. 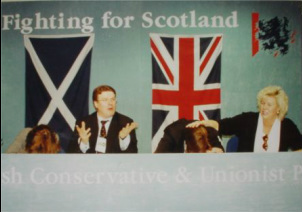 However, being contracted as the press officer for the Scottish Conservative and Unionist Party at the last minute in 1997 turned out to be one of the best jobs that I have ever had - intellectually stimulating and brilliant fun. I was put up in a bed and breakfast just around the corner from the Party's Campaign HQ, so I ate and drank politics 24/7 - from collecting and reading all the papers in the morning to consuming the midnight news on Radio Four. Upon reflection, it's clear that the national campaign allocated us more resources than the seats in Scotland really deserved on a cost-benefit analysis. However, I got to work with an energetic bunch of people who listened to me pontificate on every issue under the sun until they all feel asleep (in this photo the famous 'Frau Helgar' is on the right!). Little did we know that the loss of seats in that Election would herald over a decade of New Labour. Did they turn out to be a 'danger'? I'll leave you to decide!